This Homfa colorful kids bookshelf is perfect for books toys collection in toddler's bedroom, living room, easy to assemble and save space. 【Good Material】E1-grade MDF board + Non-woven fabrics, Environmentally friendly material to make your child feel comfortable. 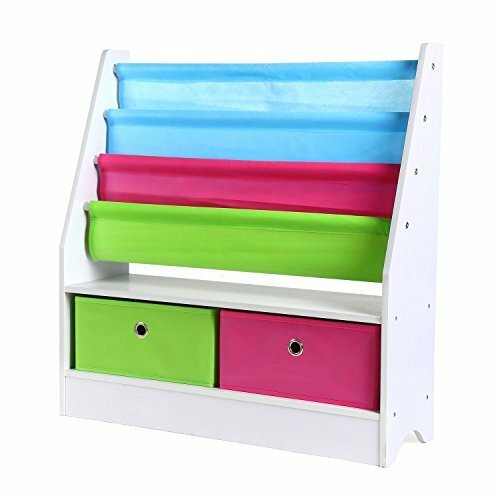 【Multifunctional Rack】With several colorful sling storage sleeves and two folding drawers, are perfectly sized to hold all different types of toys, books, art accessories, pens, stationery, shoes and more. In addition, good-looking color matching also makes children happy to receive this gift. 【Space-saving design】It is perfect for book storage in your toddler's bedroom, playroom, nursery, or the living room. You can put it anywhere in the room or in the corner, it will not take up space.